Do you have a guaranteed compatible product for HP 177 cartridges? I bought original HP363 ink (not from you) for my printer thinking these were replacements for the HP177 cartridges but now find they don't work as HP has "region specific ink" and the printer rejects then telling me to put in HP 177! My Photosmart C6283 printer (bought in Dubai) is now junk unless I can find a supply? It's hard to beat the HP C6283 for quality printouts and reliability. Eventually your HP C6283 will polish off its printer ink, and when that does happen you'll quickly discover that purchasing HP C6283 ink tends to be really pricey. You don't need to get worried about paying the high purchase prices you'll get on the main street because here at Cartridge Save you can pick up all the HP C 6283 cartridges you'll ever want at little cost. Save more money on your ink by buying with Cartridge Save! There's little point to spending out so much on the C-6283 original cartridge or C6283 compatible ink down the main street when it is much more straight forward to save a load of cash buying with Cartridge Save. Have complete peace of mind when you order PhotoSmart C6283 ink cartridges from us because every single one is protected by a cast iron money back guarantee. Keep in mind that each purchase has free delivery, most likely delivered to your doorstep on the next working day! Suitable for a home office requiring printer sharing, the HP Photosmart C6283 is an all-in-one printer, copier, and scanner that is easy to network. It prints on a wide variety of paper media, and can even handle iron-on transfers and transparencies. The HP Photosmart C6283 can handle wired networking, but does not support wireless connectivity. Its duty cycle is 3000 pages per month, so it is not the best solution for heavy-volume requirements. The design of the HP Photosmart C6283 is no different from that of its C6200 series mates. A pivoting LCD display is integrated to make it easy to access files from memory cards. This device features a low-capacity paper tray, beneath which is an auto duplexer for those who want to print on both sides of the paper. The HP Photosmart C6283 supports card readers for different formats, including Memory Stick (Duo, Pro), Secure Digital, xD Picture Card, MultiMediaCard, and CompactFlash. 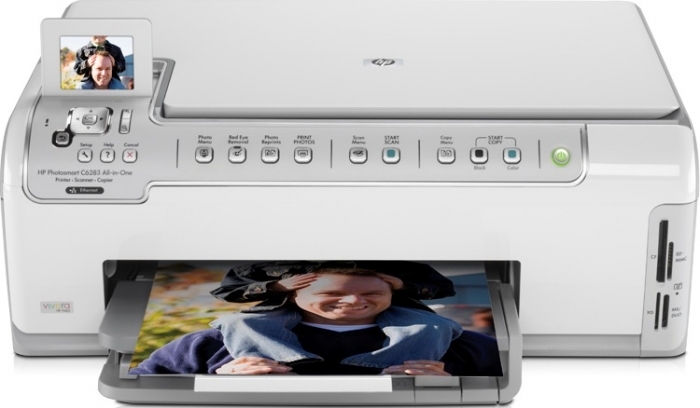 The inclusion of a scan and copy feature is definitely a plus for the HP Photosmart C6283. Users also appreciate the auto duplexer and a digital copier that supports reductions and enlargements (25% to 400%). The maximum resolution for colour prints is about 4800x1200 dpi, and 1200x1200dpi for black. The printer also uses individual ink cartridges, which is a more economical alternative to tri-colour tanks. The HP Photosmart C6283 does not support wireless printing, but it does offer networking through wired connection. It also lacks PictBridge support and stops working the moment one of its 6 cartridges runs out of ink.